Entry No. 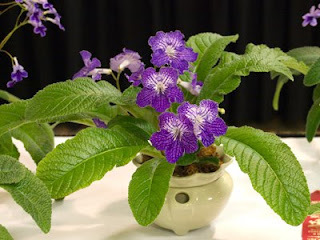 138, Streptocarpus 'Summer Parfait', exhibited by Carol Hamelink. Score: 92. First Place. Entry No. 188, Streptocarpus 'Crystal Charm', exhibited by Gail Gray. Score: 86. Second Place. Entry No. 372, Streptocarpus 'Night Beacon', exhibited by Richard G. Carr. Score: 85. Third Place. Entry No. 447, Streptocarpus 'Crystal Charm', exhibited by Paul Lee. Score: 84. Entry No. 374, Streptocarpus 'Midnight Blue', exhibited by Richard G. Carr. Score: 75.